Canadian bacon and cheddar cheese is a winning combination sure to delight your family or guests. 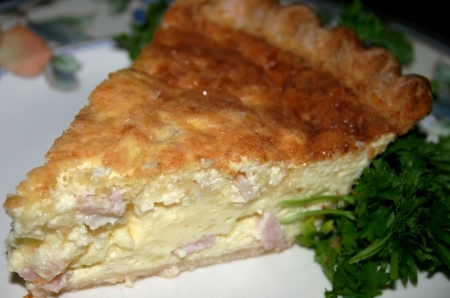 Remember quiche is not just for breakfast, it is great for lunch and dinner too. Round it out with a side salad for a quick and tasty lunch or dinner. If you like this one using the Adams Reserve brand New York Extra Sharp Cheddar Cheese, try my other versions –White Cheddar Cheese, Bacon and Jalapeño Pepper Quiche or White Cheddar Cheese and Broccoli Quiche. Place and mold pie crust into a deep pie dish about 2 – 3 inches deep or just use the tin that. Don’t precook. If using a deeper pie dish, extra eggs and cream may be needed. In a medium sized skillet heat vegetable oil over medium high heat. Add onions and sauté until translucent. Remove from heat and set aside. In a large bowl using a mixer, beat eggs until fluffy. Add half and half, salt, onions, Canadian bacon and shredded Adams Reserve brand New York Extra Sharp Cheddar Cheese. Using a spoon mix until evenly combined. Pour into to the pie crust and bake in a preheated oven at 375 degrees for about 30 minutes or when a butter knife is inserted it comes out clean. Allow to cool for about 5 – 10 minutes before serving.